Louvre Hotels Group chooses a Campanile hotel in Shanghai to kick off its first high-tech hotel experience. With this attainment, the group becomes the first in the industry to launch the ‘High-Tech Hotel’ label, a state-of-the-art ecosystem teeming with innovative automated features and destined for clients and employees alike. 2017 statistics revealed that high-tech houses in France have soared, reaching 30 millions. Equipped with a domotic system, these houses feature advanced assistance that carry out users’ daily tasks. Among the newly introduced chores : Vacuum cleaner robots, video surveillance systems, gates and electrical shutters which can be controlled at distance. So what makes the hotel industry eager to adopt these advanced smart features ? A high-tech hotel implements new technologies to cater to its clients needs and accompany them during their stay. 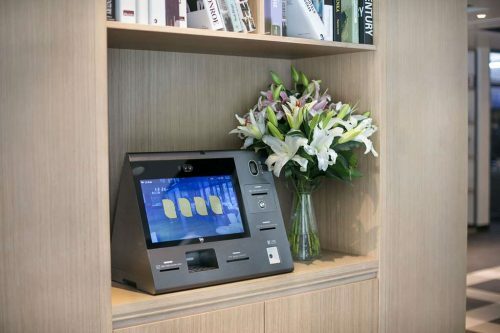 The automated check-in kiosk in Campanile Shanghai helps clients register upon their arrival and provide them with a mobile key, before a robot shows them courteously to their room. Once they reach their New Generation Campanile room, clients are immersed in a well designed environment where robots assist them or operate controls on their behalf : quality of air, light, video and audio devices. This helps personalize clients’ needs and optimize energy consumption, which makes embracing green energy and protecting the planet another perk of this technology. In the hotel restaurant, clients can use a simple QR code to follow up on their order or pay the bill for example. This service delivers better information and is much less time-consuming for guests. Moreover, high-tech hotels foster interactions and promote sharing between travellers. 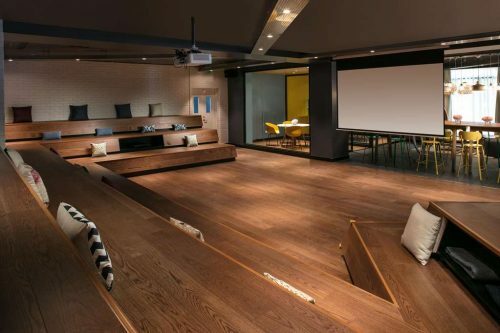 Take the lecture theater adjacent to a lobby and equipped with a giant screen, it is ideal for co-working and relaxation. This innovation benefits also employees. Each team operating in a given department have access to a global application that allows employees to centralize tasks. A room to clean ? A meal to deliver for room service ? An item to displace in a room ? Every single task is registered on this app which generates better communication and saves time when it comes to task assignments. The main objective is not to push the hospitality industry to replace or eliminate hotel employees, but rather increase their availability to better meet client’s needs. smart hotels throughout the world, and aims at securing a leading position in the Hotel industry for the five coming years. Article written by Océane Pilot – M2C.